I have many, many projects to show you, but those will have to wait for now - I have important news! 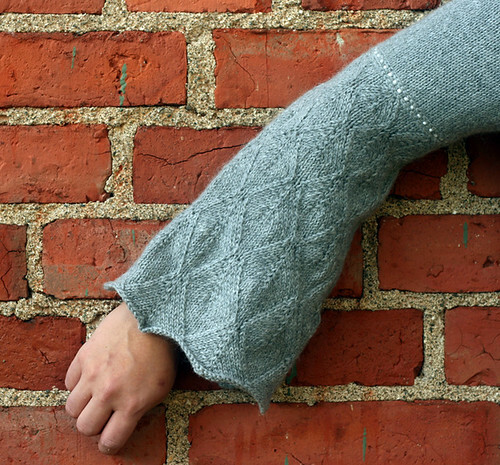 The Liuhu Alpaca Tunic Pattern is now available through Ravelry! It's the first of the TTS sweater patterns and means a lot to me. When I got this yarn, I wanted to knit a long, warm tunic with an air of elegance and grace. The yarn itself was ideal for such a project: 100% baby alpaca is extremely soft, warm and yields a lovely drapey knitted fabric. The beads add a feminine touch to the garment, and the shaping of the tunic was designed to complement many body types and sizes. The method of top-down knitting allows for modifications for the perfect fit and length. The name Liuhu (pronounced Lee-oo-who) can be roughly translated to “Slinker” in Finnish. The name refers to the characteristic of the yarn - it is slippery and splits rather easily. The end result is worth it, though! XS (S; M; L; XL; XXL; XXXL). Bust circumference 34(36; 40; 42; 44; 48) inches or 86(90, 106; 110; 115; 122; 131) cm. Waist circumference (measured 4” below underarm) 30(32; 34; 36.5; 38.5; 41; 44) or 76(82; 87; 93; 98; 105; 114) cm. Hem circumference 45(48; 51 1/2; 54 3/4; 58; 61; 64) inches or 115(123; 131; 139; 147; 155; 163) cm. All measurements given for finished garment. 22 sts and 28 rows in stockinette stitch = 4 inches or 10 cm. 24” or 32” circular needle in US#4 (3.5mm) and #5 (3.75mm). Adjust needle size to obtain correct gauge. Heavy Sport or Light DK weight yarn 1100(1200; 1350; 1500; 1650; 1800; 2000) yards. Note: You may need more (or less) yarn if you modify your tunic. See pattern for modifying options. 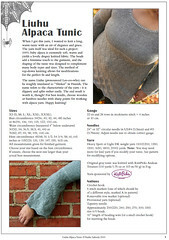 Original gray tunic was knitted with KnitPicks Andean Treasure (110 yards/1.75 oz or 103 m/50 g) in Fog. 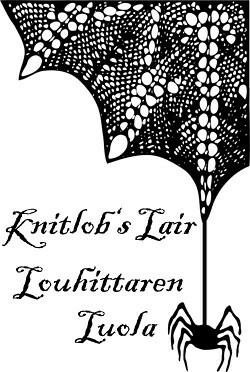 Yarn sponsored by KnitPicks. This tunic is knitted from the top down using the Tailored Sweater Method. 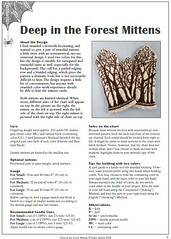 No knowledge of the method is necessary to knit the tunic, but basic knowledge of how to knit from the top down is very useful with this project. 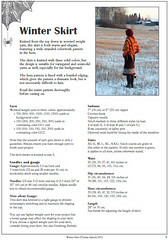 This tunic is recommended for advanced knitters. For more information on how to work pullovers, tunics, cardigans, jackets, T-shirts, dresses etc. 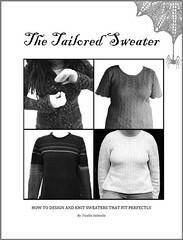 from the top down with your own measurements, see the Tailored Sweater Method information. 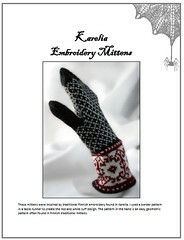 There is also a Ravelry forum for the method. This design offers you great possibilities for variation and modification. You can choose to work the neckline deeper or shallower than the original. You can also work the sleeves to a desired length, as well as the body. 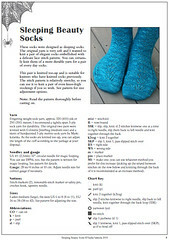 See pattern for modification options. As many of you know, I am a huge Adam Lambert fan. Have been since the days of American Idol, and still can't quite understand how and why I happen to love his music. (My playlists usually consist of Metallica, Rammstein etc.) And since I got tickets to his concert in Helsinki last Saturday, I went hunting for proper accessories, and lo and behold, discovered a glitter-addicted person who won't say no to leather. I know, I was shocked too! Last summer, a group of friends gathered to spin together for a weekend, and we did exchanged gifts too. My swap pal gave me the prettiest batt ever, which was (aptly) named Adam shortly thereafter. And the batt eventually became one of the prettiest yarns I have ever spun! 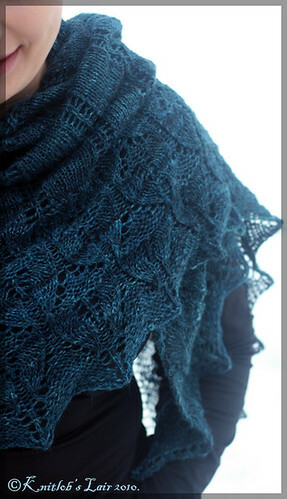 I just knew this yarn needed to be a shawl, one that would show it in all its glory. 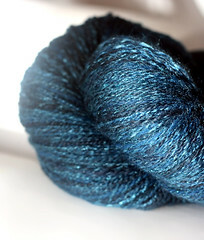 The batt had merino, BFL, firestar and silk in it, and it has a very elegant sheen to it. (Impossible to photograph but believe me, the glitter makes it shine like nothing else.) 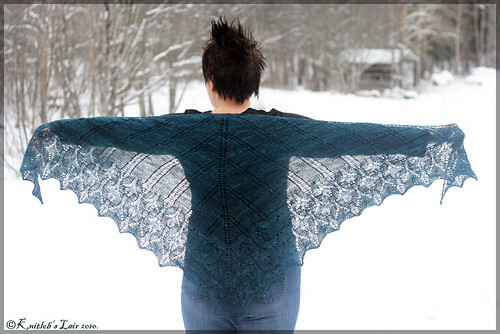 I searched far and wide for a proper pattern, until it hit me - this yarn needed to be another Icarus! I've knitted two or three already, and I love the pattern. It's simple and easy, and works incredibly well with handspun yarns. Needless to say, I love it. Loved knitting it, love wearing it, love it. I was a little worried of the yardage. 710 yards is not a lot for a shawl, but it ended up being just enough - I had probably less than 10 yards left when I cast off. I did five repeats of the body, then the full lace section, but left out the last 5 rows of finishing. I've never liked the way they look, and I would've run out of yarn anyway. 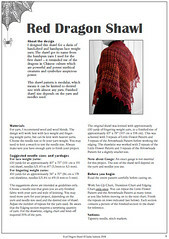 In the end, the shawl measures some 40 inches by 79 inches after blocking. 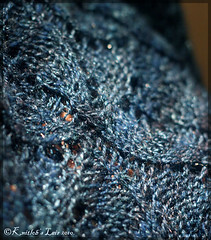 A really poor photo below shows (hopefully) the glitter in the shawl. And since I found the glam princess in me, a bonus photo: I went a little glitter-happy today.